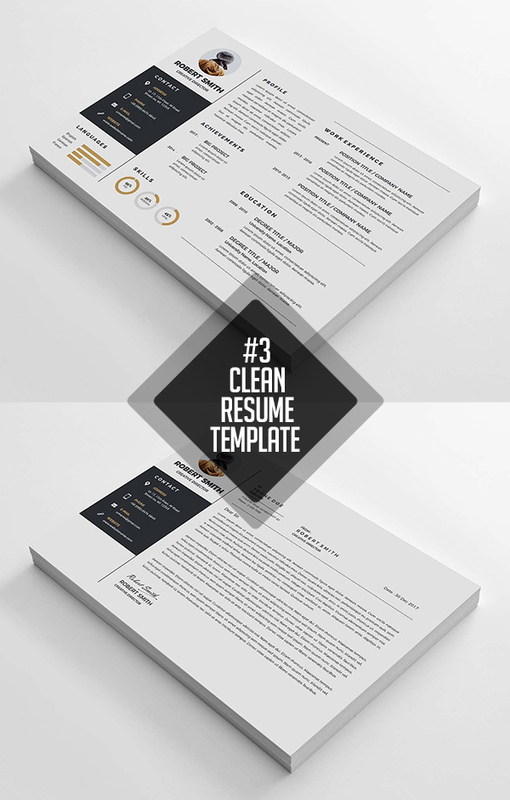 Clean and minimal resume templates and CV /Resume templates print designs to help you land that great job. 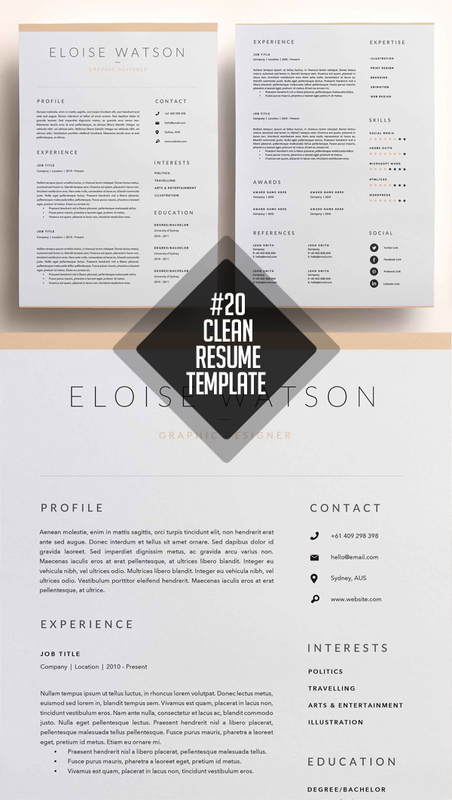 Simple and elegant design resume templates are fully editable and easy to customize and edit the typography, wording, colors and layout. Each template drawn by professional designers used a strong baseline document grid. Resume templates are perfect for photographers, designers, and developers with easy to customize fully Photoshop layered PSD files. 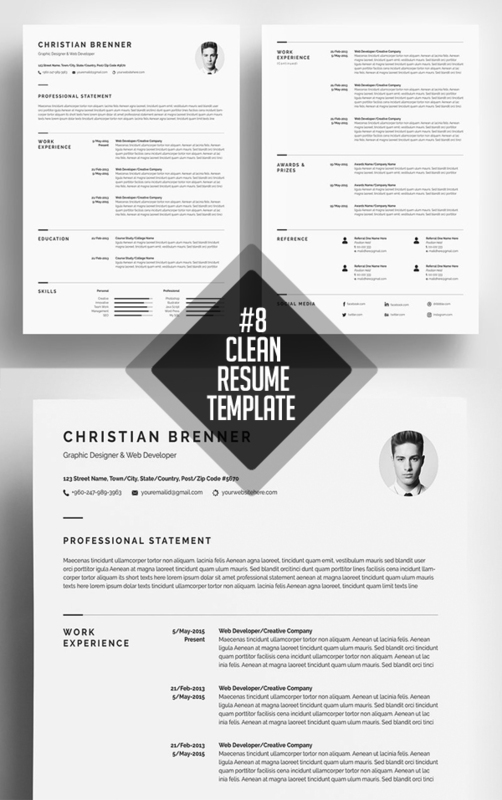 Clean Resume/CV is very Clean, Creative, Modern, High Class & Professional Design Template. Save your money & cost your time, impress your Boss with this, Wow! One Page Resume/CV & One Page Cover Letter. Text, Fonts, Color & All Elements 100% Editable & Customization. A4 & US Letter Sizes Paper. CMYK 300 DPI Two Spot Color Template Design. Professional two page design with striking cover letter and minimalist design theme. Everything is editable including fonts and colors so be sure to personalize to suit your needs. Move and duplicate elements and make the design your own. 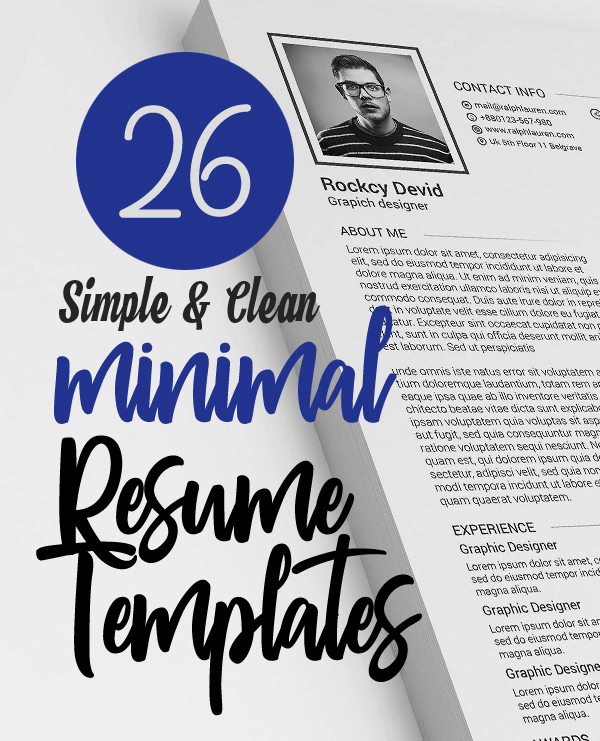 Download the Digital file for a professionally designed and easy to customize 2 Page Resume Template, One Page Related Certifications & One Page Cover Letter (Bonus 30+ Icons Pack). You receive 4 Unique pages! You can use these templates for years to come, and change the colors and fonts if you would like to give it your own unique personal touch. Professional two page design with matching cover letter and funky triangle/polygon header. Everything is editable including fonts and colors so be sure to personalize to suit your needs. Move and duplicate elements and make the design your own. This resume template will help you get noticed! This template is also fully customizable, so you can easily modify it, you can change the fonts, colors, layout, add your own photo and even add and delete sections. The package includes a resume templates, cover letter example and a references template in an elegant, modern theme. Downloading the file will allow access to your professionally designed, 2 page resume template + cover letter + references. The template can be easily customized to your liking and includes all necessary files for a quick set-up. Delete or add anything you desire in the document, change colors or simply keep the original design. Downloading the file will allow access to your professionally designed, 2 page resume template + cover letter. The template can be easily customized to your liking and includes all necessary files for a quick set-up. Delete or add anything you desire in the document, change colors or simply keep the original design. 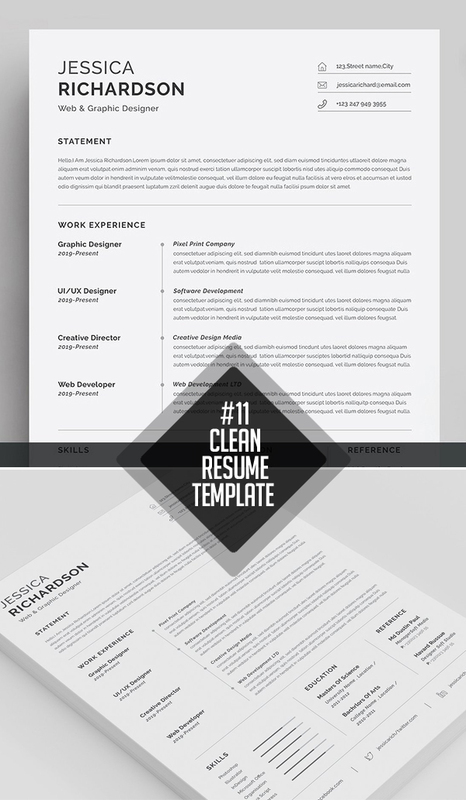 Clean & simple design which includes 1, 2 & 3 page resume/cv template & cover letter. All details are fully customisable and usable forever. You can make any kind of adjustments on these templates to suit your taste. This Professional and Modern Resume Template with Extra Reference Page Cover letter to help you land that great job. The Template is Very Costumizable, You can change the color as you like, Remove unnecessary object and add your Own Information. Clean & professional design which includes 1, 2 and 3 page resume/cv & cover letter + references page. You can change the fonts, font size, text color, layout, delete anything you do not need. If you don’t like the color of icons, lines or logo be free to change it into another. You can also choose the template with logo or your personal image. This is a specially designed handcraft clean resume cv with cover letter & portfolio template in clean style. You will test a modern style and fully designed in black and white color also ironic. In this diy resume download you will be able to create your own fully customization resume set where you can display your education, skills, references and experience also a real and very effective cover letter. We created the professional and high-quality resume template to help you make a great impression when applying for a job. All designs are easy to edit and fully customizable. You can use these templates for many years over and over. We produce high-quality, creative templates that may help you land your dream job or simply create a better looking business. Professionally designed, we take a unique approach to boring business documents, creating modern, sophisticated and easy to use templates just for you.